- Birla Precision offers the largest variety and highest quality Shell Mill Holders on BT/DV/CAT/HSK shanks. - Size Range- 16-60 mm in metric & 1/2 to 2 in inch version. 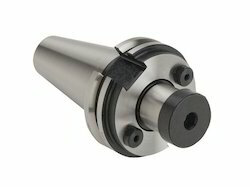 We are engrossed in offering a fine range of Tooling Systems to our invaluable clients. Sourced from SECO, these products can be availed in modular and solid styles for the best possible flexibility and precision. The range is manufactured as per the guidelines of ISO, DIN, BT and Seco-Capto standards at our vendors' premises. We are wholesale Combi Shell Mill Adaptors. - Available in BT, SK and HSK Tapers. - Used for mounting face mill and shell mill cutters. We offer the largest variety and and highest quality shell mill holders on BT/DV/CAT/HSK shanks. Size range:16-60mm in metric & 1/2" to 2" in inch version. The run out of pilot dia is within 0.008mm or 0.0003" w.r.t. taper. - Combi shell mill holder to DIN 6358. OTHER SHANKS WITH DIN-69871-A, DIN-2080, ANSI-B50-1978(CAT) WILL BE OFFERED. DRIVE KEY SLOT AND TOOL ARE IN SAME PLANE. “L AND “M SHOW SIZE WHEN BORING DIA “D IS AT MINIMUM.